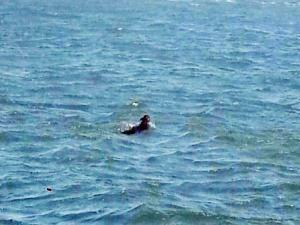 Heroic Rescue of a furry friend in Durban Harbour! A group of brave, kind-hearted people aboard an offshore supply boat sprung into action, when they saw a desperate dog fighting for his life. The 4 year old male was swimming in the sea outside the entrance to Durban Harbour on Sunday. He was initially mistaken for being a seal when he was spotted midway between the South and North piers. But the men on board the boat Ocean Stroom could not believe their eyes when they realised it was a dog! Due to the size of the blocks on the pier, the closest place for it to scramble ashore was more than a kilometre away. The boat, skippered by Quinton Shooter, with a crew of four, had just been out to sea to resupply a tanker and bring three staff back to shore. Worried that the dog would drown any minute, Shooter called up port control to report there was a dog in the channel and that he was going to help it. He did a circle to reach the greyhound and tried to coax it on board, but no avail: the boat was too high for it. It managed to get on to the partly-exposed rudder, but had to be chased off as the boat was in danger of hitting the pier. Then, after everyone debated on how to rescue the dog, the skipper put down a platform – a green step-ladder – and the tanker security team leader picked up the soaking dog. “Everyone was happy that we had rescued him. He was extremely tired,” the skipper said. The owner of the boat, Lamont Hitchings, took the dog home for the night and fed him and contacted Kim Samuels of Project Dog, which rescues and finds homes for about 60 animals a month, to see if she could help. Samuels collected the greyhound, which she promptly nicknamed “Seadog” and took him to vet, Dr Kerry Easson, for a check-up. Easson, who does a lot of rescue work and already has greyhounds, decided to adopt the dog, but will rename him. “The dog is friendly, but very scared, traumatised and obviously exhausted,” Samuels said. She had no idea how the dog ended up in the sea, but said it was the second time one had been fished out of the water. Easson said the dog had fur missing caused by a rope or a collar and was very submissive. It also had sores and worms and “probably had a hard life”. It was still exhausted, had sore muscles and had slept all day yesterday. The mystery of how he got in the sea would probably never be solved, Easson said. She would vaccinate the greyhound, microchip and deworm him. This is an amazing story of bravery and the loves for animals. Movember Mos – Why Are They Doing It!! Moses Mabhida to host MTN8 final – SOLD OUT! !